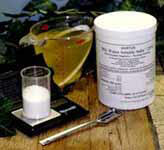 * Above 20 Rhizopon AA Water Soluble Tablets per liter, 1000 ppm water soluble IBA, use Hortus IBA Water Soluble Salts. Yoder Garden Mums and Asters (2008-2009). Yoder Brothers, Barberton OH. Yoder Handling Un-rooted Perennials (2004). Yoder Brothers, Barberton OH.